It is important to make your display instantly recognizable with your company Logo. Having a corporate tablecloth creates a clean professional appearance. Unique and interesting displays catch the eye. An exhibitor's personal appearance is a part of the overall visual effect of the display, so look professional. Organize your display to facilitate easy-access and maximize product visibility. Maximize your product display space by using pop-ups and tabletop displays. Take advantage of height differences, on display tables place small items in front and tall items in back. To avoid looking cluttered, do not have too many items on display. We at Biotechnology Calendar, Inc. are professionals, skilled at helping you to secure valuable laboratory research leads. At our shows we provide furniture, accessories, and organizational planning to accommodate all of your product exhibition requirements. 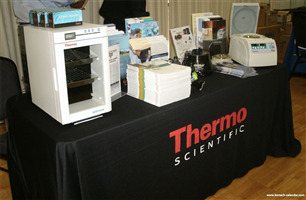 We are the most experienced on campus biotechnology tradeshow company in the US, with 20 years in the business. In order to have a successful biotechnology trade show experience, keep in mind you are always on stage, and you have only one first chance to entice your customers. Therefore, its important to pay attention to the details and create a display that is eye catching and has a professional appearance.